I have very faint memories of the Roman Catholic mass being said in Latin from when I was very young. I remember mouthing what I thought were actual words, although they meant nothing to me, and thinking that I was an active participant in the mass like my sisters and brothers and parents, next to me in the pew. When I investigate now when the change from Latin to English happened, it began in 1964, right before I turned six. Mostly I just remember mass in English. So my Latin was non-existent through most of my life, if I had ever even known any! I didn’t know it was Latin; I only knew when four groups of girls’ voices sang it in offsetting phrases to make the round, it sounded like angels. She laid down all the tracks, so the round was recreated with her beautiful voice filling out the angel chorus. As it went straight to my heart and triggered that memory of camp and singing and angel choirs, it made me want to know more. So all those years later, I finally looked up what those Latin words mean. 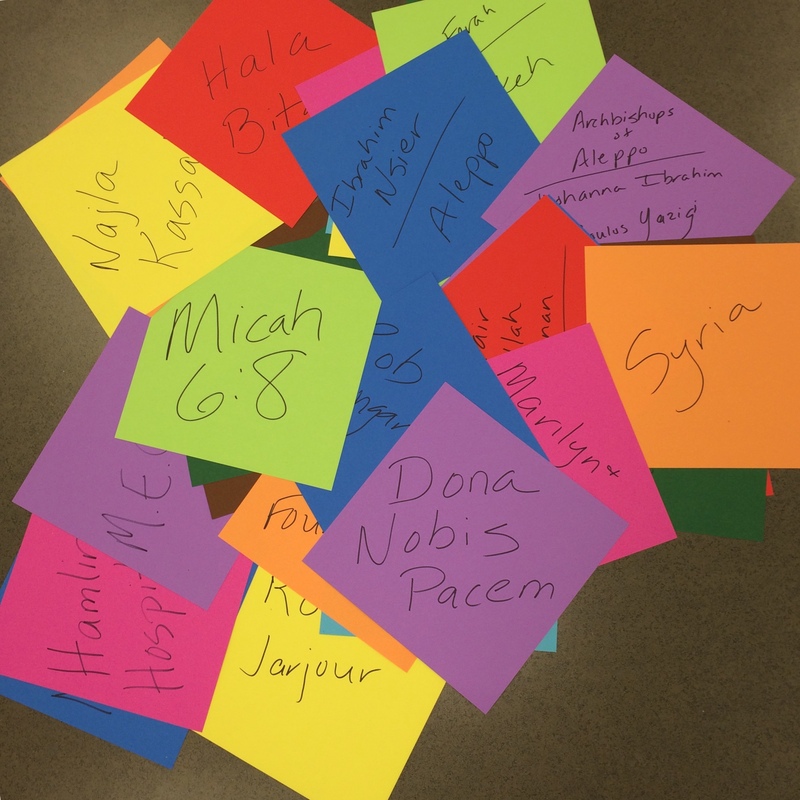 Dona nobis pacem…grant us peace. And that has been my prayer ever since in the midst of family upheavals and tragedies, in the midst of transitions at church, and of course, in my journeys into the deep waters of a relationship with God in the Middle East. Dona nobis pacem. Grant us peace. Lamb of God, who takes away the sins of the world, grant us peace. Not only does this prayer in an ancient language remind me of the generations of people who prayed it in community before I was conceived and born, but it reminds me to whom I am asking this request. It is a prayer to the Jesus who knows suffering because he experienced it. Because of his great mercy, he redeems us and wipes our slates clean. And we know this, and I know this. And so we come to his feet and ask him: have mercy on us. Grant us peace. And he can. And he will. And he does. And I know this because I have seen it in Lebanon and in Syria and in Iraq. I have witnessed those living this suffering even now as they are put upon by forces and evil that would wipe them out. And they stay. And they pray in ancient languages: in Syriac, in Latin, in Arabic. Their prayers take flight and arise heavenward to the Lamb of God who takes away the sins of the world. And mine join with theirs in this upward trajectory. Prayers, like birds on the wing, flying to the throne room of the Lamb of God. 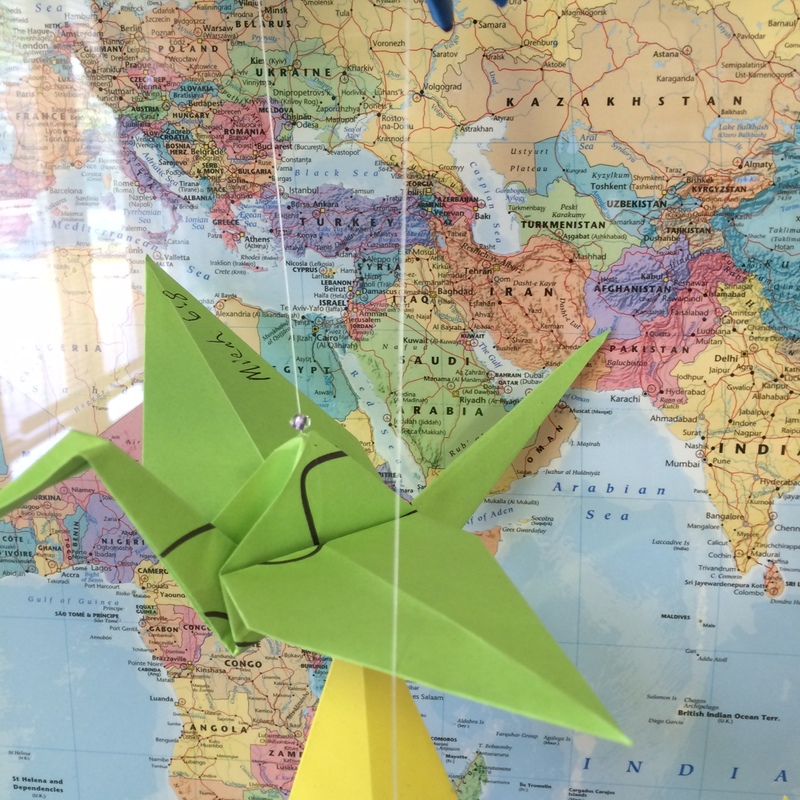 And because the Clifton Strength Finders tells me that one of my top five strengths is connectivity, I have connected my journeys with the faithful of the Middle East to my prayers of peace for them to this visible expression of those prayers in origami cranes. 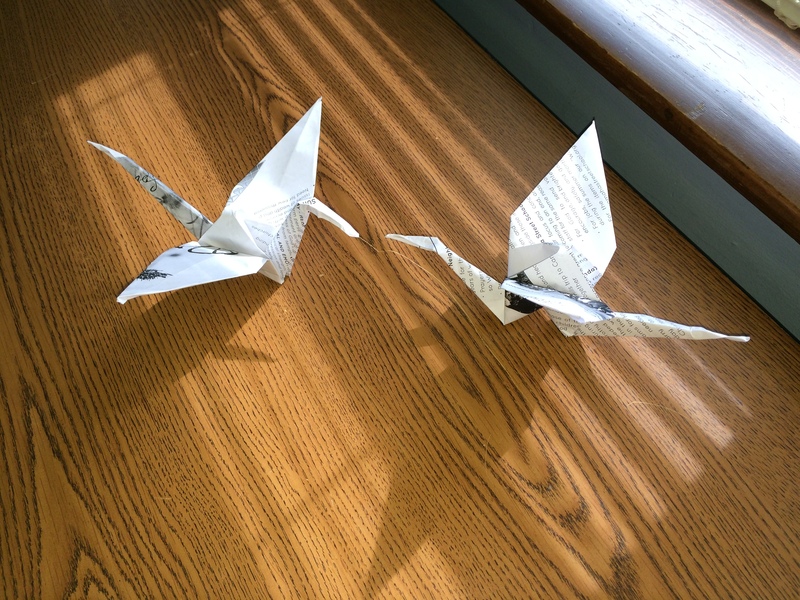 The legend of the one thousand paper cranes comes from Japan, and is especially poignant when you read of a young girl who was poisoned with radiation from the bombing of Hiroshima. Folding one thousand paper cranes is supposed to bring you luck or a wish granted. She was hoping for healing of her cancer, which didn’t come to her. She was not healed, but maybe one day her wish will be granted in another way: maybe nuclear weapons will be eliminated so the threat of cancers and destruction caused by them will be wiped out. Maybe. Maybe there will be peace. I have folded 96 so far on my journey to one thousand. On each one is written the name of a person, or a place, or a piece of scripture, or the words of a hymn, or simply the word peace in any language I can find. 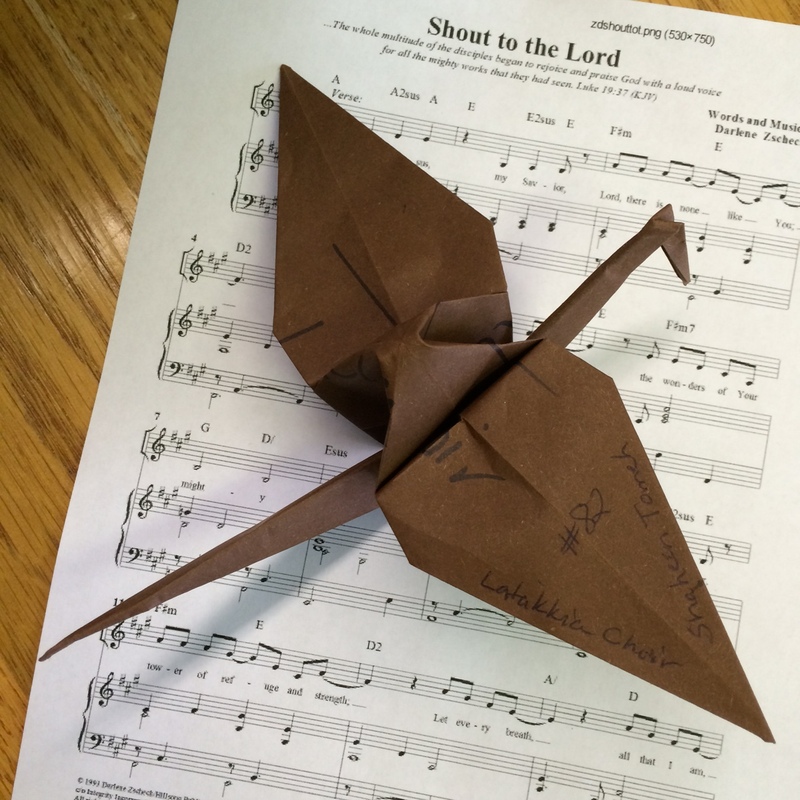 As I fold each one my simple prayer of peace is attached to each one in the motions of making the crane. The prayers are repeated and joined as I string them on nylon thread, separated by beads. It reminds me of the act of praying the rosary. 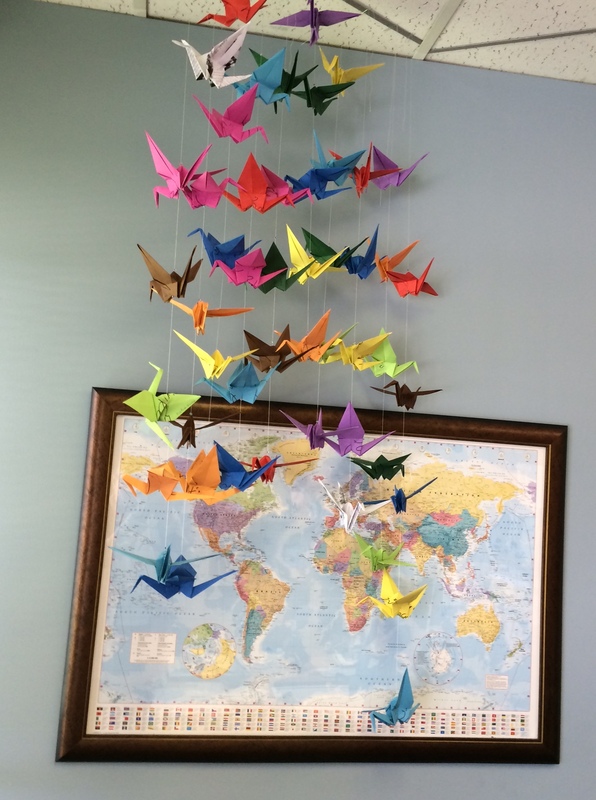 The prayers are repeated again as I hang the strings of cranes in my office near my map of the world – God’s creation – where this peace is so needed. Every day as I enter my office, I have this visual reminder and expression of those silent prayers. And it gets larger every day with another crane, ten more cranes; another string; five more strings. And one day it will reach one thousand. Grant peace to the people of Syria, whose war has dragged on for over four years. Grant peace to the people of Iraq, whose troubles and war run on unabated since our country’s terrible decision to invade in 2003. Grant peace to the people of Lebanon, a country that becomes a proxy and pawn for the evil ideas of others; a small country that has borne a heavy burden from these other two wars as they are overrun with refugees. Grant peace to the pastors and churches and their congregations who stay and serve and minister in the midst of extremist attacks and destruction and death. Grant peace to those who have lost everything and are searching for new homes. Grant peace to your world, Lamb of God. Let us know your peace which surpasses all understanding. Thank you, Michael, for lifting this prayer. Dona nobis pacem. What an awesome meditation. I may need to learn to fold cranes. I can teach you and will be quite happy to do so.